Q: So, how MUCH did you enjoy the book? A: I liked it. Didn’t love it. It was an easy read for me because I watched the careers of all of the players being discussed and already knew about some of the stories described by McCallum. 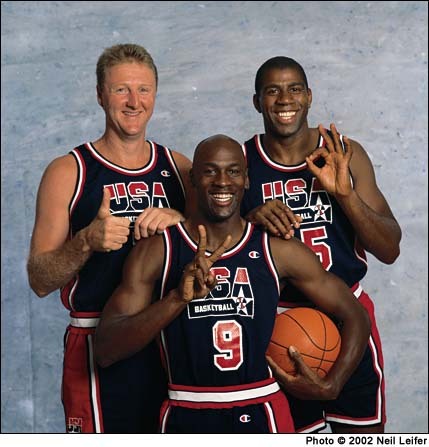 That isn’t to say I’m a know-it-all on everything Dream Team; just that these players–particularly Jordan, Johnson and Bird, whom McCallum focuses most intensely–have been and continue to be in the public eye and their stories are pretty well known by NBA diehards. Also, I’ve watched NBATV’s new Dream Team documentary twice now, and there is obviously some overlap between the movie and the book. I think that a sports fan who only casually follows the NBA might LOVE this book–it’s jam-packed with funny anecdotes and revealing interview answers from the team members about one another. But I only “liked” it. Q: Which player is painted in the best light? As Magic yo-yo dribbles on the left side, Bird suddenly comes off Laettner and steals the ball. He bumps Magic slightly, but even the gentleman from Italy (the ref) is not going to call that one. As Magic tumbles to the round, Bird takes off, Barkley in pursuit, pursuit used lightly in this case. (As a matter of fact, takes off is used lightly, too.) Bird fakes a behind the back pass to a trailing Jordan (eds note: perhaps this move is a Celtics tradition?) and Barkley takes a man-sized bite at it, his jock now somewhere inside the free-throw line. Bird makes the layup. McCallum asked Jordan about the play, and shared his remark. That wasn’t the only instance in the book where Jordan has a compliment to pay Bird. But my favorite Bird story–maybe my favorite part of the whole book–was when McCallum described Bird’s legendary shoot-around sessions. I spend more time than most wondering what the league’s best shooters make out of 100, when shooting around. I figure an elite corner shooter can probably make over 80 from that spot, standing still. But 95 out of 100 while moving around?! I guess that’s why they call him Larry Legend. Q: What player is painted in the worst light? A: You mean besides Isiah Thomas? I’d say Magic Johnson. I should begin by pointing out that McCallum states that Magic was better than Bird. But his reasoning was lame. He basically says that he can’t decide, and Magic has more rings, so he wins. (On Twitter, this reasoning invites a #RINGZ quip.) But despite paying respect to Magic the player, McCallum reinforces two common beliefs about Magic’s personality that make him less endearing to some fans. First is that Magic always wants to talk about Magic. Christ, do you ever watch the ESPN/ABC studio show? If Magic isn’t telling us about his Laker teams, his boothmates are there to ask him about them. The book not only drives this annoying quality of Magic’s right off the pages, but McCallum even gets some juicy quotes from Jordan where he’s basically making fun of Magic for his obsession with he and Larry’s Parallel Career Story. Jordan says outright that he doesn’t believe that Larry is nearly as excited about reliving all of that as Magic is. It’s not an unpersuasive argument either. Magic is obviously a nice person and Charles Barkley makes clear on TNT from time to time that Magic is extremely generous to charitable causes. He’s not a bad guy. But it IS annoying that he always wants to talk about himself. Years later, I would watch Magic in a pickup game at UCLA, this one without referees, and he would win the foul battle virtually every time, stand around incredulously until he was awarded the ball, and, on defense, pointedly play through his own fouls and act like a petulant child when one was called on him. The guy McCallum is describing. I know that guy, and I hate that guy. McCallum had plenty of great things to write about Magic the ball player, but after finishing the book I came away with a better impression of Larry and a worse one of Earvin. Q: Last question: Did the book change your opinion of the Dream Team as a whole, or how it stacks up against subsequent Team U.S.A.’s? A: In a way, no, and in another way, yes. Toward the end of the book, McCallum writes about the huge effect that this Dream Team had on international basketball; how foreign programs that used to look at Russia for a model now looked at the NBA. He points out specific current NBA players who were in their formative years in ’92 and credit that viewing experience for their own development. I continue to believe that the lowered competition gap between America and The World is because they got better, not because we got worse. But the parts of the book that perhaps made me feel differently about this group were the stories about playing cards all night, talking trash (Larry, Michael and Magic had a “rings table” where only champions could play in that card game) and having a bond that I doubt would exist in a modern Dream Team. Some of that was due to the close friendships between teammates like Jordan and Barkley, and Magic and Larry, but I got the sense from reading this book that these players viewed the whole concept of “team” differently than stars do today. I realize it wasn’t THAT long ago, but I buy into the notion that AAU and recruiting 13-year olds has taken something away from team basketball and locker room camaraderie. I sound like an old person. I’ll stop now. I recommend reading the book, whether you love basketball or just “like” it. If nothing else, it’s stuffed with important hoops history and funny stories.